And you thought dogs couldn’t read! Home → News → The Latest → And you thought dogs couldn’t read! Yes, indeed, that’s Mack – reading my book, The Shelter Dog. When Julie Nowicki, from The Grey Muzzle Foundation, sent me this picture I knew I had to follow up on the story. So I contacted Tina Valant, Mack’s two-legged companion, and here is their story, in Tina’s own words. Meet Mack – an e locus (rare color), rescued Australian shepherd. Living a true rags to riches story; he was abandoned in the woods and hit by a truck (how he got his name and broken back leg). He lived at a vet’s for five months, surviving heartworm treatment. “It was love at first sight when I saw him (online),” stated Tina Valant-Siebelts. 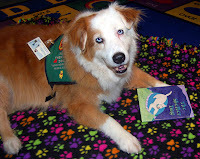 Tina had two dreams: Mack would be in Florida with her, and would become a reading dog. Everyone said she was crazy. 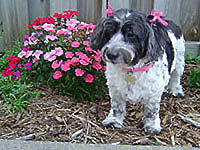 Following her heart, she flew to Houston and brought Mack home March, 2001. They trained and were certified as an animal assisted therapy team that fall. Mack and Tina participate in HS of Broward’s Wags N Tales program, geared to children ages 5-12. The Shelter Dog is one of their favorites and in Mack’s library bag! They were recognized for their outstanding service and promoting rescue/adoption this past fall. They reside in south Florida with Tina’s husband Bob, four other rescued aussies, cats, birds and three iguanas. To learn more about Tina be sure to visit her website TinyValant.com. To learn more about improving the lives of older dogs who are waiting for their forever homes please visit The Grey Muzzle Organization. I agree – Tina is a true earth angel! Mack is wonderful! Thank you Tina! Great story and great job, Tina. I’m going on Amazon to find the book. Mack is GORGEOUS!